Your new favourite notebook and smartwatch? Will it finally get a successor next year? Apple's long-rumoured Retina MacBook Air may finally be getting a launch next year following a new report that it will enter mass production in spring 2015, along with the Apple Watch. Citing anonymous sources on the supply chain side, Digitimes reports that a 12-inch Retina MacBook Air featuring Intel's new Broadwell processor is on the way. The notebook, which has been rumoured to exist since 2012, has been pushed back due to the slow supply of components from the Cupertino-based company's supply chain players, according to the report, an issue that it says has been resolved. The Retina MacBook Air is expected to be ultra-thin and lighter than previous MacBook Air models in addition to being "fanless", allowing for a redesigned chassis. Following the success of recent iPhones and iPads, Apple will apparently offer it in gold and two different shades of grey. 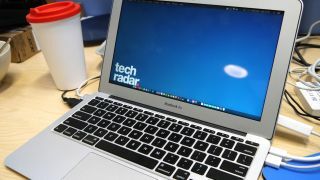 According to the report, the Retina MacBook Air is being manufactured by Quanta Computer and is expected to be a high-end product that will initially be available in limited supply.